Recently voted as one of the top 3 finalists at the twelfth 'Interaktion Dirigentenwerkstatt des Kritischen Orchesters’ by players of the Berlin Philharmonic and various professional orchestras all over Germany, Chinese-born New Zealander Tianyi Lu has been hailed as one of the most exciting and innovative young conductors of her generation, championing the works of contemporary composers and bringing a fresh vitality to classic works. In rehearsal, concert or masterclass, Tianyi has conducted internationally with players from the Berlin Philharmonic, St. Petersburg Philharmonic, Berlin Sinfonietta, New Zealand Symphony Orchestra, Tasmanian Symphony Orchestra, Auckland Philharmonia Orchestra, Auckland Symphony Orchestra, Hopkins Sinfonia and Waikato Symphony Orchestra. She was the Music Director of the Chamber Opera 'The Electrical Eclipse' at the University of Auckland in 2011, has worked as an assistant with Auckland Choral and the Melbourne-based womens' choir Cloud9. 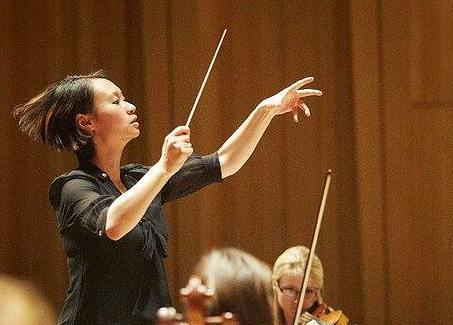 In 2010 Tianyi was one of the youngest active conductors to be accepted into the prestigious Symphony Services International Conducting Training Programme, and has attended various international conducting masterclasses in the UK, Germany and Russia. Highlights include her acceptance into the Jarvi Academy (July 2014) and becoming voted as one of the 3 finalists to work with professional orchestral players from all over Germany in the ‘Interaktion Dirigentenwerkstatt des Kritischen Orchesters’ in Berlin. Tianyi is currently based in the United Kingdom where she conducts and assists orchestral and opera productions at the Royal Welsh College of Music and Drama. At the RWCMD she has conducted in three concerts - 'A Concerti Showcase', ‘Mahler in Miniature’ and ‘Baroque Pearls’ - as part of REPCo for student enterprises and conducted backstage in Mahler’s Symphony No. 2 in 2013. Tianyi also works with orchestras around Wales such as the Abergavenny Symphony Orchestra and the St. Woolos Players. She was the Music Director for “We Remember Them: An Evening with Mala”, a highly successful concert for the Holocaust Educational Trust in Cardiff, and was also involved as a guest speaker in the pilot conducting programme ‘Women Conductors at Morley’ in London. Tianyi began orchestral conducting studies at the University of Auckland with Uwe Grodd, with whom she completed her Bachelor of Music with First Class Honours in Flute Performance. She then studied with John Hopkins at the University of Melbourne, Australia, where she co-founded the Hopkins Sinfonia and conducted its inaugural concert in 2013. Other teachers have included Alexander Polynichko, Kenneth Kiesler, Christopher Seaman, Pietari Inkinen, Eckehard Stier, Marko Letonja, and Sebastian Lang-Lessing. She has also studied choral conducting with Dr. Karen Grylls at the University of Auckland and Simon Halsey, director of the Berlin Radio Choir. Tianyi is currently studying with David Jones, the Conductor-in-Residence at the Royal Welsh College of Music and Drama. As a flautist and composer, Tianyi has been the recipient of a number of awards, including First Prize in the New Zealand Woodwind Competition and top awards in the Douglas Lilburn and Llewellyn Jones composition competitions at the University of Auckland. Her broad musical interests has also led her to study the baroque flute, violada gamba, harpsichord and electronic music composition in her undergraduate years. As a singer, Tianyi has performed in venues such as St. Paul's Cathedral, London and the Esplanade, Singapore with the University of Auckland Chamber Choir .She has also been involved in the Sistema Aotearoa programme in New Zealand, and loves to teach.